PAINTER PARK, Minn – ‘Merica F-Yeah!! 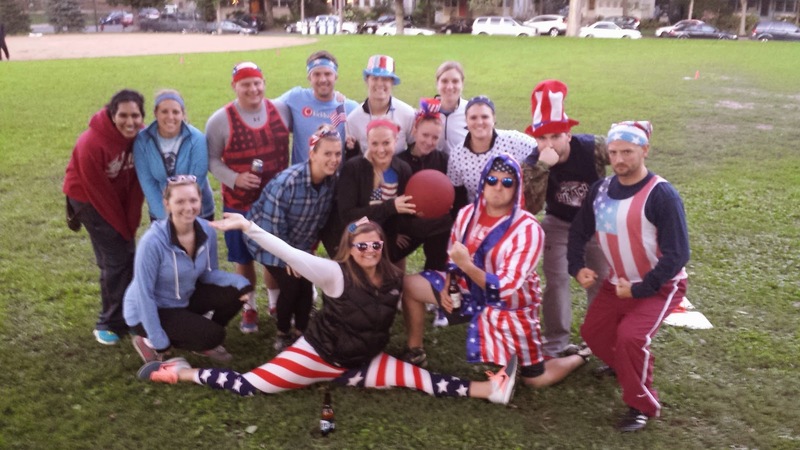 Ball so Hard showed up to the park on Patriot Day with more spirit than any other team on the kickball fields… Only to be left with their Red, White, and more Blue… Balls than any other team. Ball so Hard jumped on top in the 1st with great kicking from Cleo, Jess, Jon, Lauren, Tina Time, and Cory. The other team, Pitch Don’t Kill my Vibe, scrambled to grab two in the bottom half of the inning following a questionableish play from catcher @headbandhi5guy throwing the ball into the other field. Inning two was lame. Inning three, four, and five were lame with only scores from the other team. Inning six featured a lead off single from Sir Joe Long and consecutive ground kickballs from Swatty, Tracy, and Laura to drive him across the plate to score Ball so Hard’s 2nd run of the contest. It was a blue ball day for Ball so Hard as they dropped the match up to a ma-ruined team 5-2. Top plays of the night: Jello-O Shots, a slew of double plays of Ball so Hard’s superior defense, and Phil cross checking the opposing teams 2nd basemen in an attempt for a homerun (sincere apologies expressed). MVP of the week goes to ‘Merica for being ‘Merica, Lauren H. is awarded Ms. America for her dedication to our country with incredible leggings, Cory is awarded with Mr. America for his sweet robe, Swaytha, Tracy, and Laura get the award for top collaborated ‘Merica dress, and Tom gets the most improved award for his dedication to watching the tutorial videos on kicking with you head in front of the ball in an effort to drive the ball vs pop it up. Week four features a theme of Lumberjack vs ThePod on Field One. Those willing to chop down more trees than one are welcome to join on field one at 6:30 p.m. to Referee.